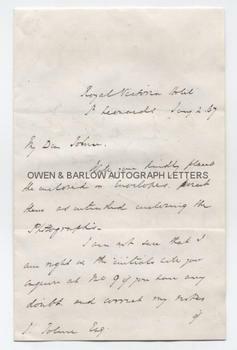 THOMAS BRASSEY autograph letter Signed. British (English) engineer. Builder of railways. ALS. 2pp. Royal Victoria Hotel, St Leonards. Januuary 2nd 1867. To John Tolmé. "Will you kindly place the enclosed in envelopes. Direct them as intended enclosing the photographs. 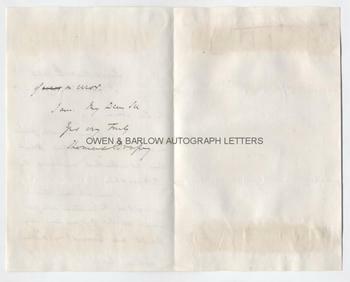 I am not sure that that I am right in the initials, will you enquire at no.9 if you have any doubt and correct my notes if in error." 8vo bifolium. Approx 7 x 4.5 inches (18 x 11.5 cms). Mounting residue to verso of integral blank leaf. Else near fine. Thomas Brassey was the greatest builder of railways in the 19th century and, arguably, of all time. By the mid-19th century he had build about one third of the total railways in Great Britain and, by 1870, he had been responsible for the construction for 1 mile in 20 of every railway system in the world. This included three-quarters of the lines in France, major lines in many other European countries and in Canada, Australia, South America and India. He was also a builder of bridges, viaducts, sewerage systems (including the London Sewerage system designed by Bazalgette), tunnels and docks (including the Victoria Docks in London). 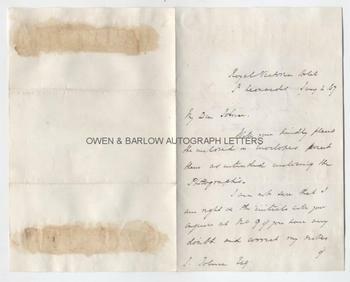 Thomas Brassey is here probably writing to the son of Julius Horn Tolme, the Cuban born civil engineer, who had been articled to Joseph Locke and, at this time was in partnership with W.R. Galbraith, railway engineers.